Batteries are only displayed as High, Medium, and Low. 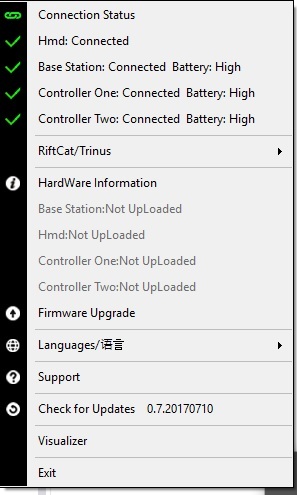 This was only a recent change though, until a few versions ago the window would show % for all connected hardware. Might be nice to see it return as just having low, medium & high is hard to gauge sometimes. Yeah, I think the changed that because the numbers are not totally reliable or customer friendly. My base never charged beyond 90, usually mid 80s. Maybe there is some difference between different units. If the maximum charge is displayed as "high" instead of 90% no one will get annoyed. Yeah I guessed it was changed due to inaccurate information being relayed back to the software. None of the hardware is past their initial firmware which might've been the reason for this switch so they might look back into this once they've got the software side more stable.